When I recently visited the Weald and Downland museum it made me think about the vast changes that have taken place in the building of houses: the materials, the look, the installation of windows, heating systems and much more. 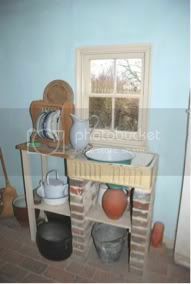 I don’t like the cold - well damp cold actually - and when I visited the Weald and Downland Open Air Museum in early December 2010, I kept saying to myself how grateful I was to have windows and heating in my home! As much as I am fascinated by the development of domestic interiors and always say I would like to go back in time and visit certain periods of history – I’m not sure I could cope with the little luxuries that have become so ubiquitous in all of our homes! Bearing in mind this was one of the coldest days of December, minus 10 degrees.... and although dressed to face arctic conditions, I just could not imagine living in this beautiful BUT very cold medieval house with no glass panes (see above)! 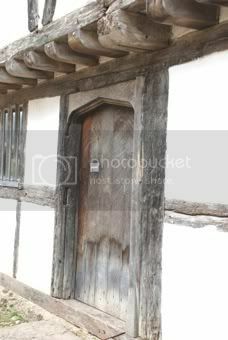 This classic medieval dwelling, dating back to the 15th century form North Cray in Kent, has unglazed windows. Unglazed windows let in light and allowed for ventilation, and although glass was introduced by the Romans in circa AD65, glass was not widely used until the 13th century in churches and the 16th century in domestic houses. On the picture above, you can see the amazingly wide floorboards that were prevalent at the time, large trunks cut into large planks, something that came back in Georgian interiors much later on. The red timbers on the window mirror the external timbers (Elm) on the outside, a tradition which survives in French and German towns today) and evidence from other sources show that medieval buildings often had painted bright red timbers. In this particular building, the Market Hall dating from the 16th and early 17th century, we see glazed panes and rather lovely window furniture. This room served as a town council chamber. The temperature difference was substantial although still cold. But it does make one think about the effectiveness of a building’s envelope- when sealed it makes a drastic change to the inside temperature. What struck me most about these houses and public buildings, however, was the level of detailed decoration, something we rarely see in the building of new houses. Although many examples of buildings here at the Museum did not all belong to the higher echelons of society, it seems that whoever built the roof structure, the windows, the floors, the walls, the stairs, etc... took great pride in adding decorative elements. In the Museum’s largest barn, Court Barn, a late 17th to early 18th Century building, smaller exhibitions feature the history and development of stained glass for example and windows (Glazier’s workshop), as well as a very interesting display of plumbing artefacts ( The Worshipful Company of Plumbers) through the ages. 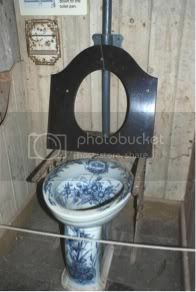 Again, we all take for granted the “bathroom” and “kitchen” elements we use daily, but again we see the level of decoration even for the humble loo! And below this rain hopper is amazing – just another functional item elevated to something more decorative and indeed rather beautiful. 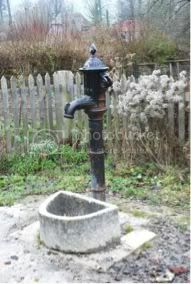 And remembering that most of us in the Western world do not fetch water from a stream or a pump, this gorgeous water pump one outside one of the Cottages was simply delightful. In this cottage, the kitchen is basic but rather charming, although if one had to feed a hungry family of 5 or more people, this could become rather tight. But as we can see here, they had already thought about placing the sink by the window! Some things do not change as most of us today have sinks overlooking the garden. I noticed that in one of the cottages, the skirting boards made of wood were placed flat onto the wall and the plaster was flush with the board. Today we see the skirting boards, facing the wall after the plaster has been done. I understand from one of the guides there, that any wall plastering was expensive, so they tried to use it diligently, by not going all the way down! This mural below was also another wonderful detail, I noticed. 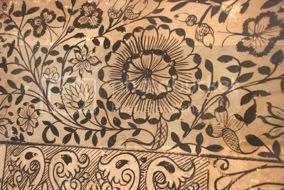 The Fittleworth Mural Paintings are delightful Tudor paintings discovered in the upper chamber of a timber-framed house during renovation in 1968. 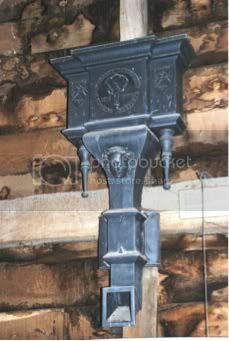 Preserved under a layer of reed plaster, they had at the time, extended to the whole room. 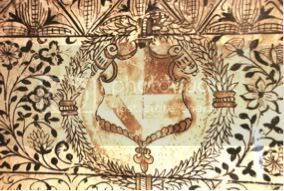 Executed with considerable skill, there is no suggestion of stencilling here and we can see the introduction of colour – yellow ochre on the second picture with the heraldic design. I love the free flowing lines and the repeated patterns, an amazing find. SO HAS A LOT CHANGED? 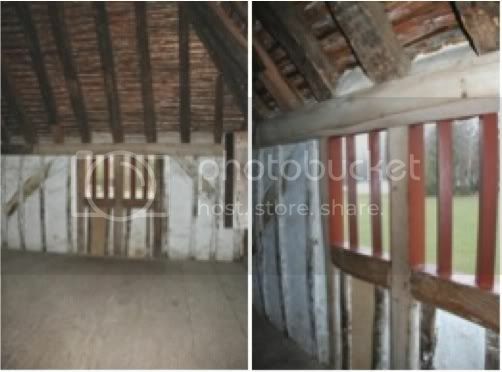 Well certainly studying and looking at period interiors such as these, does highlight the basic elements that the normal populace had in their home environments from medieval time to the 18th century houses. What is wonderful to see in such a place as this museum, is the development of the kitchen or cooking and gathering areas of houses, going from a central hall where everyone gathered and ate together with multi-use furniture to the private chambers that were featured in later farmhouses or cottages, away from the cooking and social areas. I also delighted to see the decorative details on floors and walls. Intricate patterns of stone placement, or brick designs. They even painted false bricks on stone to give the illusion of a higher status house. A lot has changed in so much that we have now the very best facilities at the touch of a button, the twist of a tap, the flick of a window stay. Years and centuries have enhanced the functional elements of all these things, better insulation, better heating, better services, better materials. But in all this efficiency drive have we lost some whimsy? The eye delights in seeing details and decorative touches and today I feel it is too often sacrificed for strict, straight lines.